Sale Planet, similarly to Happy Cloud and Cash Kitten, is a useless and potentially unreliable ad-supported program from the SuperWeb family that may sneak onto your computer without your noticing it. While its name suggests that this application is all about best offers and deals available on the web that could “save you time and money” as the famous slogan goes, unfortunately, you cannot trust any content this adware provides you with. As a matter of fact, we have found that the advertisements this adware keeps annoying you with can lead to unreliable websites. Due to the exposure to potentially harmful third-party web content, we advise you to remove Sale Planet from your computer. But since this adware may not be the only threat right now endangering your operating system, we also recommend that you run a malware scanner to identify all the infections that may be present on your PC. 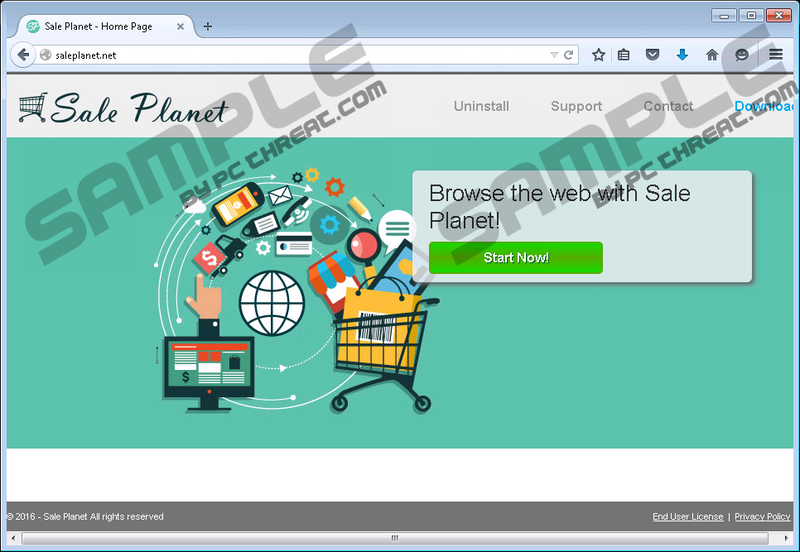 You can find the official webpage of this adware at saleplanet.net, but do not expect anything too flashy. As a matter of fact, this is a suspiciously minimalist page with practically no useful information about this application and no possibility for download either. This is rather strange behavior when it comes to a promotional website; if we can call it that way at all. Although there is a download menu and a dedicated page, it is quite misleading. On this page you will find instructions to download this application, but the download will not start up. So we can say that it is virtually impossible to get this program from its own website. It is quite likely that you have never even seen this webpage or that you do not even recall installing this adware. The reason is that this useless application may have entered your operating system in a freeware bundle. Keep in mind that bundling counts as a questionable distribution method since schemers can use them to deliver several malicious software installers packed together. Therefore, they mean a multiple security threat to your computer. Letting such a malicious bundle onto your machine can have serious consequences. That is why it is important to know that you may download such packages when you land on unfamiliar and questionable file-sharing websites, such as shareware and torrent pages. Since these pages may host a number of shady and misleading third-party ads, you may even accidentally click on one thinking that you are about to download your target application or movie. But instead, you will end up with a bunch of malware programs on your PC. If this may have happened to you lately, we advise you to take it seriously and run a full-system malware scan right after you remove Sale Planet. It is easy to spot this adware once it has been activated on your computer because it will start to display its third-party ads possibly labeled as “Ads by Sale Planet” or “Provided by Sale Planet.” If you do not want to end up on malicious websites we suggest that you do not engage with any content generated by this adware. You also need to know that when an adware application is on board you may not be safe even when you view otherwise reputable and trustworthy websites because the third-party ads on those pages might be hijacked by such a malicious program. You cannot just close these potentially harmful ads and restarting your computer will also not help. The only way to put an end to such an exposure to malicious web content and further infections is to delete Sale Planet from your system. In order to be successful with the removal of this useless application, you need to do more than just simply uninstalling this program via Control Panel. Since this adware seems to be blocked by the latest versions of Google Chrome, you may not need to remove the extension from that browser, but we did include the instructions just in case. However, you certainly need to take care of the extensions in Internet Explorer and Mozilla Firefox as well. Please follow our guide below if you need assistance with these steps. If you want to make sure that your computer is clean of all infections and safe for you to use, we suggest that you download and install a reliable anti-malware program that will also protect your PC from further malicious attacks. Press Ctrl+Shift+A to access the Add-ons Manager. Quick & tested solution for Sale Planet removal.